Impress your friends and family with these delightful bacon & chive scones served with lashings of butter (poppy seeds could be replaced with sesame seeds or cheese). A lovely savoury twist on traditional scones! Heat oil in a frying pan over medium heat. Add bacon and cook, stirring, for 2 minutes or until crisp. Add onion and cook, stirring, for 5 minutes or until soft. Transfer to a plate lined with paper towel. Set aside for 5 minutes to cool. Place flour and sugar in a bowl. Use your fingertips to rub butter into the flour mixture until it resembles breadcrumbs. Combine milk, chives and bacon mixture in a jug. Make a well in the centre of the flour mixture and add milk mixture. Use a round-bladed knife in a cutting motion to mix until just combined. Bring dough together with your hands. Turn onto a floured surface and knead until smooth. Shape dough into a 2cm-thick disc. Use a 5cm-diameter round pastry cutter dipped in flour to cut out scones. Place scones, side by side, on tray. Brush with extra milk and sprinkle with poppy seeds. Bake in preheated oven for 15 minutes or until scones are golden brown and sound hollow when tapped on the top. Remove from oven and transfer to a wire rack. Serve with extra butter. gosh, these look amazing, how the heck did you get them so perfect? Thank you! what a delicious combination! 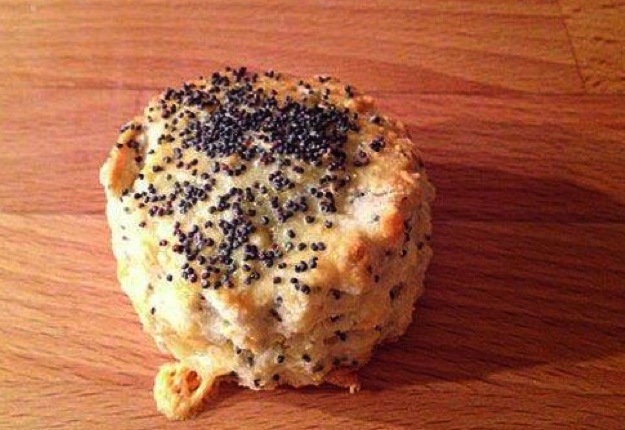 I’ve had bacon and cheese scones before but not with poppy seeds, next time I will try this. thanks. I don’t think I’ve ever had savoury scones before. Will be giving these a trial run! I’ll bet these are absolutely delicious. Never heard of this type of scone before today. Will have to do this. I love savoury scones!! Thanks for sharing your version, will be happy to give it a go!! I’m a huge fan of savoury scones and this sounds fabulous. Would be great with grated cheese in it too. Yummo! Will definitely try this. Thanks!